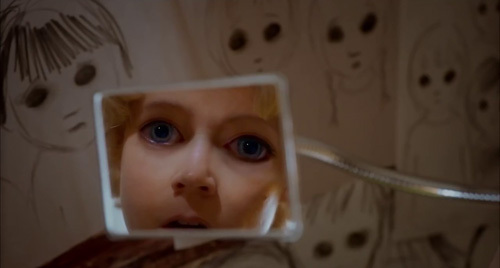 (SPOILERS) Tim Burton’s second biopic may not reach the dizzying, adoring and infatuated heights of Ed Wood, but it’s his best picture since his other Big, Fish, more than a decade ago. He probably won’t be returning to such “plucked from life” territory in a hurry, though, no matter how offbeat the subject matter, since Big Eyes sits at the bottom of his grossers next to Ed Wood (ironic, or telling, since it’s his best film by some margin). The story of Margaret Keane, her weird and unadorable portraits of children with huge eyes that made her name, and the husband who took all the credit, is rich material, and it frequently takes flight, albeit it is much more grounded as a whole than typical Burton fare. Yet even with eccentric fare such as this, Burton succumbs to the linear shortcomings of the biographical movie. Scott Alexander and Larry Karaszewksi historically have something of a knack for bucking the trend in so-so and so respectful biopics. They were behind Ed Wood, The People vs. Larry Flynt and Auto Focus (concern the peccadillos of Bob Crane, of Hogan’s Heroes fame). Less assuredly they also penned the Andy Kaufmann picture Man on the Moon (still, more of deserving of praise than it often gets), but it should be noted – and looked forward to – that on the same lines they have a true crime anthology series starting next year (American Crime Story), which taking the “true” tack is able to both mimic True Detective’s new cast/story a season format and strike out on its own. 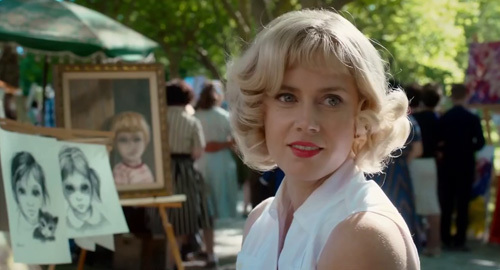 Margaret (Amy Adams) and her daughter flee her first husband, only to arrive in San Francisco where she falls for another shady character. 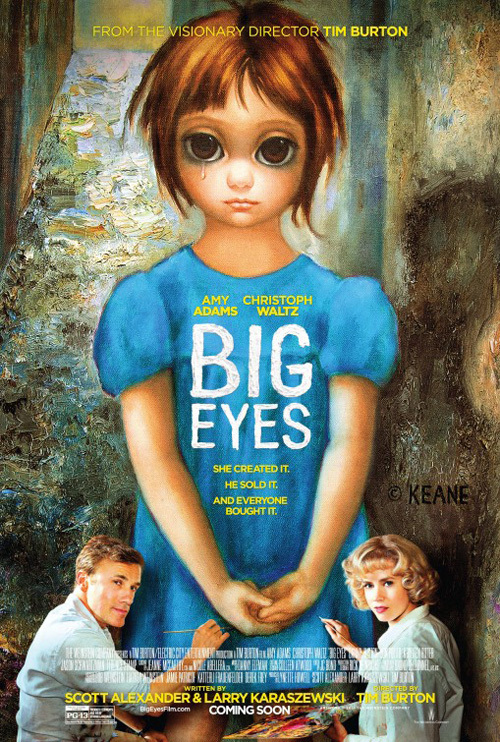 Walter Keane (Christoph Waltz) is all charm and flair, an instant showman with a gift for selling himself. While Burton’s picture offers the morsel of defence that Walter wasn’t initially selling Margaret’s art as his own, it’s also evident that he had no qualms about taking the credit once the first mistake was made. 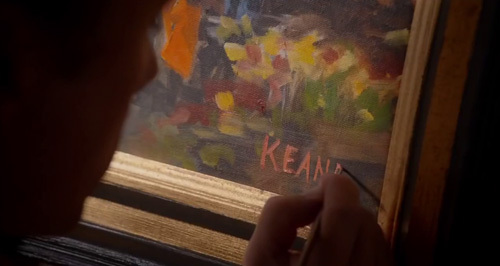 When we discover that Walter, who has inveigled himself on the art scene and made connections and conquests there, invented both his painterly credentials (he paints his name over pieces he has bought) and his time in France, it comes as little surprise (the clues are there early on), but it’s fuel for Margaret to finally decide to leave him. That she doesn’t immediately, and that she puts up with the deceit (attempting to keep the truth from her daughter, well played in young and old versions by Delaney Raye and Madeleine Arthur respectively) over the course of a decade is a point handled with a degree of believability by the writers. The truth is, there isn’t one clear answer. Living in fear of Walter is cited (and his threat to kill her) but we never really get that sense (the scene building up to their leaving, where he is throwing lit matches at Margaret and Jane, is rather absurd in the disproportionate fear it elicits from mother and daughter). Her place at the time as a woman in a patriarchal world where such creativity is the provenance of men is also given its due (a Catholic priest advises her Walter probably knows best), and psychologically presents an understandable reason for submitting to Walter’s domineering behaviour. There’s an early scene where she has the opportunity to push herself forward and announce herself as the true author of her work, but she hesitates too long and Walter takes charge. There’s a sense that it is just easier for her (she gabbles on about her fascination with numerology to an increasingly confused potential customer of “her own” paintings); as she graciously offers to her ungracious (then ex-) husband in court, he was “very good at being charming” and a “talented salesman”. It’s unlikely that, on her own, Margaret would have ascended to the level of success she did (which her real life counterpart readily admits). It’s Walter who has the acumen to display her paintings in a jazz club attended by the great and good (owned by an entertainingly blustering Jon Polito) and the inspiration to sell copies of her work to the public rather than the real thing (the difference between making $500 on a single piece or selling a million cheap reproductions, anywhere, everywhere). It’s also Walter whose hubris (if that’s the right word, since it’s the result of pride in something he isn’t even the force behind) leads to Margaret submitting a piece for the 1964 New York World’s Fair (with this and Tomorrowland, there’s evidently a vein of nostalgia being tapped for the event, presumably because it represents an era of noble motives without any of that ugly cynicism – no doubt unless you were actually there at the time and involved in it). 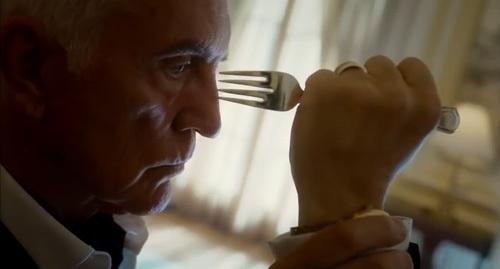 Art critic John Canaday duly eviscerates it (Terence Stamp, who may be prone to doddery old remarks about immigrants but still has it as an actor), and in terms of the picture this signals the split with Walter (he becomes apoplectic and threatens Canaday with a fork, prior to the match incident) and the subsidence of Margaret’s heyday. Her work is dismissed as “an infinity of kitsch” by Canaday, who refuses to lower himself to call it art, and its unclear the extent to which this explosion of gaudy bad taste in the early ‘60s was followed by the tail-off that now looks on it as a bizarre curiosity of a bygone age. If that’s a failing, it’s surely in a part a by-product of Alexander and Karaszewski playing fast and loose with the timeline of Margaret’s life; the trial itself didn’t take place until 1986. Such dramatic compression largely works for the picture, though, and it means the sunny ‘60s Hawaiian setting is shown off to good effect (it’s like Burton’s taken happy pills; one can just imagine him on location, with a fog machine on hand to keep him suitably overcast). The downside is that it makes the picture a little to neat and linear, something that is particularly emphasised by Burton’s buttoned-down approach. Burton collected Keane’s work, such that he had commissioned her to paint a portrait of then other half Lisa Marie during the ‘90s (Krysten Ritter, who plays Margaret’s best friend in the picture, could almost be Burton’s next generation gothic muse). One might have expected him to shrink from criticism of her work accordingly, but he appears to have no problem embracing the polar responses to her idiosyncratic art. There’s the question of why, for starters, which comes down to a period of deafness as a child and the rather hokey windows-on-the-soul explanation (notably, her more despairing tone becomes upbeat when she becomes a Jehovah’s Witness – you go, JWs!) But really, it’s preferable to the kind of pseudish responses to art Burton’s keen to skewer elsewhere (Canaday’s only really to be commended for crushing Walter). There’s also an amusing dig at Walter’s attempt to justify his assumed role also (“Maybe you have an unhealthy obsession with little girls?” suggests Margaret). 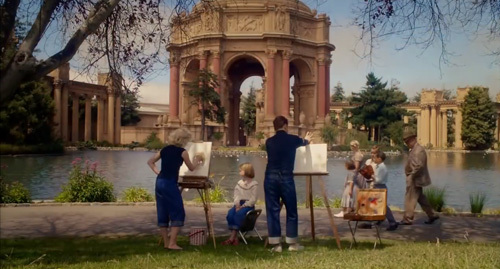 Canaday is self-evidently wrong not to call Margaret Keane’s works art; it just isn’t his kind of art. Which is why there’s the Warhol quote prefacing the movie, presumably; Keane’s painting must be good because people like them (which sounds like the most poker face comment ever, but it’s definitely one Michael Bay would relish). To Canaday it’s a fad; “He’s like the hula hoop. He just won’t go away” he says of Walter and, by implication, his wife’s work. 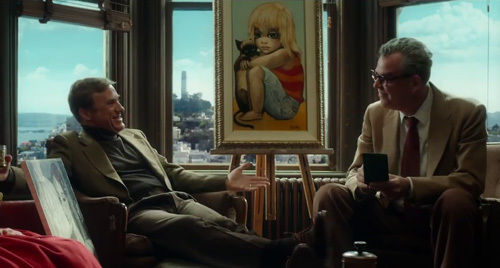 The conclusion to be reached is, appropriately for her prevailing subject matter, that art is in the eye of the beholder (in Sleeper, Woody Allen awakes in a future world that sees her as one of the greatest artists ever, this being the same world that has learnt smoking and fatty, high cholesterol diets are good for you). The sympathy in the picture is always with Margaret, and Adams’ performance is pitch perfect, subtly emphasising her retiring quality and rehearsal of the mores of the period with regard to the domestic place of women, but also the grief that comes from trapping herself in a lie she helped create. The picture is Waltz’s to steal, though, and as in Django Unchained he duly does just that. This is Waltz doing a Depp, so if you’re easily annoyed by hammy or affected performances, it really isn’t for you (his accent is very curious also). Walter is a gift of a role; loud, charismatic, self-serving, an inveterate liar (Margaret doesn’t even know about his daughter until she shows up at the door), deluded and yet perceptive enough to back a winner and a realist enough to understand supply and demand (people… “buy art because its in the right place at the right time”). 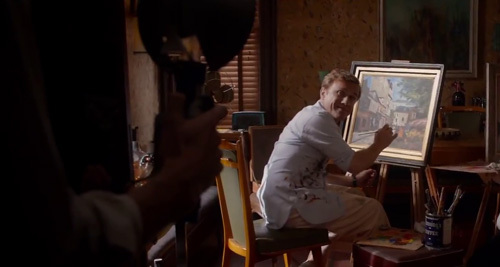 Walter doesn’t even have the diligence to find out what his wife has been painting with (“Oils? But isn’t that acrylic?” he is quizzed), and is utterly shameless in employing Margaret’s suggestions to invent motivation for painting when he appears on a TV show to justify himself. Walter’s perhaps too much of a buffoon for his threatening side to ever take believable hold, though. 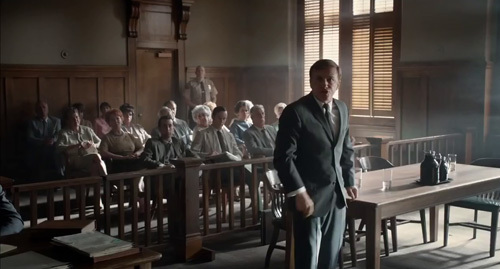 The highlight, and a dream for Waltz no doubt, is the climactic court case where Walter represents himself (his self cross-examination is obvious, but no less funny for it) to the increasing, entirely understandable, exasperation of the judge (James Saito). As with the ’86 trial, the paint-off sees Walter do nothing besides protest an injured shoulder, while the end title note he persisted in claiming authorship until his death. Typically of a Burton film, the side-lines are populates with entertaining faces. 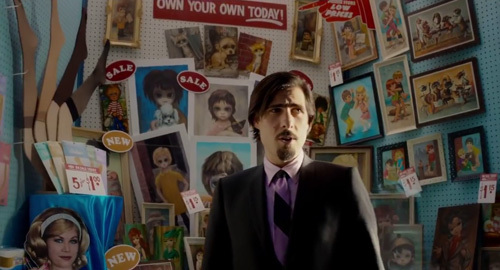 The versions of Jane appear to be partly cast for their big eyes, while Jason Schwartzman has an amusing cameo as a gallery owner and Danny Huston gives good (if, perhaps, slightly unnecessary) narration as the reporter who indulged Walter and then learned the truth. Burton’s now-regular cinematographer Brune Delbonnel lends a suitably bright and poppy colour palette, while Danny Elfman’s score is less memorable than usual (for a Burton movie). Burton himself appears to be on best behaviour, rarely indulging in weirdness (there are a couple of scenes where Margaret sees big eyes in the real world, either out shopping or in the mirror). This does make the picture, for all its weird subject matter and bold characters, seem oddly restrained and respectful. That’s not necessarily a bad thing, but it seems to underline that a biopic needs something more if its really going to escape the limitations of its genre. Both Ed Wood and Larry Flynt did that by embracing the subject matter and running with it. Burton appears caught between deference to Margaret, quite understandably, and a desire to indulge the possibilities of big, broad vulgar Walter. Nevertheless, this is a welcome change of course after umpteen pictures based on familiar properties (even his own familiar properties). He’s back on safer turf again next, with Miss Peregrine’s Home for Peculiar Children (read, Burton – or his agent – feels his bankability needs confirming since its five years since Alice). After that, let’s hope he can remember the anarchic sensibility that fueled him nearly thirty years ago if he takes on Beetlejuice 2. I’d like to see him go there, but he last showed that kind of sensibility way back in the ‘90s.